In your corporate sponsorship development process, the proposal is a pivotal tool. In this post, you’re going to learn the right way to use and develop yours. 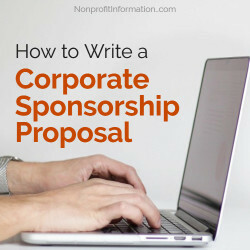 What is the purpose of a corporate sponsorship proposal? Developing and sharing the proposal occurs at a crucial moment in the sales process: when you have buyer interest and the information you need to develop it. Submit it too soon and you invariably missed critical information. Miss this right moment and your buyer is onto something else and you haven’t asked for the sale. A far worse issue is a habit that grips far too many organizations which is the attempt to sell sponsorship through the mail, sending out generic sponsorship levels, like Gold, Silver, and Bronze packages. Sponsorship selling is a complex sales process, not direct response marketing. Remember, you’re not in the mail order business. The net result of any of these gaffes is a lost sale or money on the table. The proposal, then, is one part summation of your discussions, one part business case, and many parts creativity, ideas, and strategy. It’s important to get it right. The purpose of the document is to make an offer to your sponsorship buyer. The proposal spells out how the corporation can leverage your opportunity or property—your event, program, initiative, or campaign—to drive the company’s business goals. The offer is your best recommendation to meet the brand or business’ marketing or other business goals. Here’s why it’s pivotal. In order to uncover the information you need for the proposal—indeed to determine if what you have to offer is even the right fit—you have to have a trusting relationship and meaningful discussion with the right person—the decision maker and any others involved in the buying decision. No one is going to share their priorities with you if they don’t know or trust you. What goes in your corporate sponsorship proposal? A description of your event or property and how popular it is. Feel free to tie in the role of your property for your overall organization: does it help fulfill your mission? Does it have a long history? How is the event an asset for your organization? These sections should be compelling and well written. Quality photos and video can add visual interest but are not necessary. Next you’re ready to get into the meat of the proposal: the sponsor’s goals and how you’ll meet them. The descriptions should be strategic and creative and convey a meaningful level of engagement. Paint a verbal picture for the reader so he or she can visualize what you have in mind. Sweep the reader into this section so that he or she is so excited, saying yes is easy. Review what you’ve written. Do your recommendations meet the buyer’s goals? Is this obvious and clear? Have you helped streamline the sponsor’s labor intensity? Have you also streamlined your closing and contracting process through your proposal? Are the recommendations going to propel your event and add value to your attendees? If the readers never attended your event, would they get the picture? Writing sponsorship proposals is a little art and a little science. The rationale for the proposal is science—and should be a summation of your discussion—and the art is the magic that only you and your organization can offer.